discrimination associated with mental illness. a 2-hour forum with speakers and plenty of opportunity for participant feedback and idea sharing. wayne cho who from may 2008 to june 2009 ran across canada to raise awareness of anxiety and depression. This entry was posted in depression and mental illness, news and events, peace, environment, social justice et al and tagged activism, discrimination, grassroots, mental health, mental illness, peer support, stigma, vancouver on October 31, 2009 by isabella mori. This entry was posted in queer talk, gender issues and sexual identity, wordless wednesday and tagged couples, lesbians, love, photography on October 28, 2009 by isabella mori. how many suicides are ok, mr. minister? last week, the british columbia government (the one that pumps millions and millions of dollars into the 2-week olympics next year) made cuts “changes” to the budgets of about 90 (ninety!) health agencies in the vancouver coastal health region alone. the changes cuts will mean no harm to services, says minister kevin falcon. the cuts, falcon says, are only administrative. apart from the fact that i have it on good authority that they are not just administrative, the question remains how an organization is supposed to run without administration, especially since just about all health service agencies i know are already running on razor-thin administration, and since the government keeps asking for more and more paper (=administrative) work. burnaby is canada’s best run city. can you imagine it without a receptionist? 4refuel in langley won a best small business award in 2006. how do you think they’d do without a bookkeeper? the cactus club is one of the best companies to work for. are they doing that without administrative assistants? as you know, my concern is mostly with agencies that provide services in the mental health sector, a sector that is already seriously underfunded. let’s look at one example – suicide prevention. saving lives is not such a bad idea, is it? how much does it cost? * $5,000 will make possible one 60 hour hotline training class for 25 volunteers. * $1,850 will make possible one 24 hour period of crisis hotline service for the region. * $1,000 will cover the cost of suicide prevention and intervention to save 20 lives. * $500 will train 20 youth, parents, or teachers on suicide prevention. * $250 will sponsor training for one hotline volunteer, who can answer 450 calls a year. * $100 will cover 1 week of CareRing calls to a vulnerable senior. * $75 will make possible 1 hour of crisis hotline service for the region. now think about it. someone had to gather this information. someone had to type it up. someone had to get it on the web. someone had to put the web site together, someone needs to maintain it. who do you think is doing this? guess what, it’s someone in an administrative function. ask any struggling social service agency what their major funding problems are, and they will invariably have “core funding” on the very top of their list – the money needed to pay for the invisible but highly necessary costs, without which the services have absolutely no infrastructure to rest on. if you’re a crisis line and don’t have a bookkeeper taking care of the payables, who will send that cheque to the telephone company, without which there won’t be any crisis line? so how many suicides would you like to prevent, mr. falcon? 20, or, say, 10% less because the lives of those other two people aren’t that important? This entry was posted in depression and mental illness, news and events and tagged british columbia, budget cuts, mental health, mental illness, politicians, suicide on October 26, 2009 by isabella mori. positive self-statements are widely believed to boost mood and self-esteem, yet their effectiveness has not been demonstrated. we examined the contrary prediction that positive self-statements can be ineffective or even harmful. a survey study conï¬rmed that people often use positive self-statements and believe them to be effective. two experiments showed that among participants with low self-esteem, those who repeated a positive self-statement (”i’m a lovable person”) or who focused on how that statement was true felt worse than those who did not repeat the statement or who focused on how it was both true and not true. among participants with high self-esteem, those who repeated the statement or focused on how it was true felt better than those who did not, but to a limited degree. repeating positive self-statements may beneï¬t certain people, but backï¬re for the very people who ”need” them the most. ray at the affirmation spot has an interesting discussion of this. let me add a few more thoughts. as ray points out, it looks like the researchers didn’t quite know how affirmations are best used (and i think that ray’s suggestion of how the research might be conducted next time are fabulous). unfortunately, this happens more than occasionally in social science research. from what i can tell, that can come from a) truly not having a good understanding of the research subject and b) some of the traditional methodologies in social science research. as for a), my husband, an avid poker player, often complains about that. he is very interested in psychology and enjoys participating in poker-related research. almost all of the time, however, he finds that psychologists who research poker have little understanding of the game, not appreciating, for example, that many serious poker players don’t approach it as a game of chance (like roulette, for example) but as a game of skill. consequently, the researchers ask questions that are irrelevant to these serious poker players and therefore end up with irrelevant results. i wonder whether that was similar in the research ray talks about. regarding methodologies used, we need to keep in mind that experimental research as it traditionally carried out needs to be tightly controlled, which means that the more variables are introduced into an experiment, the less control there is possible – which in turn means that researchers like to have as few variables as possible (i.e. they just use one question). there are some good uses of experimental research – the famous pavlovian dog, for instance, has spawned some truly remarkable work – but experimental research also has its limits. perhaps using this methodology was not the best one for the topic of affirmations. that, of course, poses a problem – experimental research is often seen as the only methodology that will give reliable results. in the end, we need to figure out how we would like to use this research. if affirmations have worked for you and perhaps also your clients, great. you can just look at this research and say, “hm, interesting, doesn’t seem to apply to me.” on the other hand, if you have found that affirmations haven’t always delivered what you had hoped, perhaps this research has a clue to what’s going on. note the “perhaps”. that’s what research and other sources of knowledge (and maybe even wisdom) are – little pieces of a puzzle that sometimes but not always show us the way to a bit more understanding. This entry was posted in blogs of note, emotional health, psychological research and other things academic and tagged affirmations, positive thinking, psychology, research, science on October 25, 2009 by isabella mori. you are experiencing this death in your unique way. your experience is valid for you. your response is right for you, for now. don’t let anyone suggest that you are mourning the wrong way. you are your own expert. that resonates with me. there was a time when i felt ashamed that my father’s death had not affected me as much as my dog’s did; it would have been lovely to have heard these words. trends come and trends go. philosophies are in vogue and out. stop listening to bereavement experts; they will change their minds and what is considered abnormal today will be obligatory tomorrow. for example, there was a time when experts claimed that you must talk about the death, cry about the death, wail about the death. you were instructed to go directly to a psychiatrist if you were unable to loudly express your grief. my pets saved my life. when i couldn’t pull myself out from under the covers for anything else, i did for my pets. i recommend you get a pet or two or borrow on from a friend or a neighbour. these suggestions are supplemented by people’s stories, told in their own words. i prefer these little biographical vignettes over the long-drawn-out narratives that often spike self-help books. you know the one: “one day, babette walked into my office. she was a tall brunette and worked at a prestigious bank in downtown san francisco. when she took off her jacket, i noticed her well-manicured hands shaking …” etc., etc. so thanks for getting to the point, roberta. she also doesn’t clobber the reader with simplistic “think positive” advice; in fact, in her appendix, where she lists more authors to read – something that i always appreciate in any book – she promises that the list will not contain anything that will estrange readers through overly confident and positive “smugness”. i wish your days to be filled with kindness and goodness and many reasons to smile. i wish your nights to be filled with secure sleep and sweet peace. i hope you follow a life-affirming path and i wish you a fine life ahead, full of good memories and laughter and love. This entry was posted in emotional health, interesting books, therapy and tagged bereavement, books, grief, mourning, psychologists, self-help on October 23, 2009 by isabella mori. 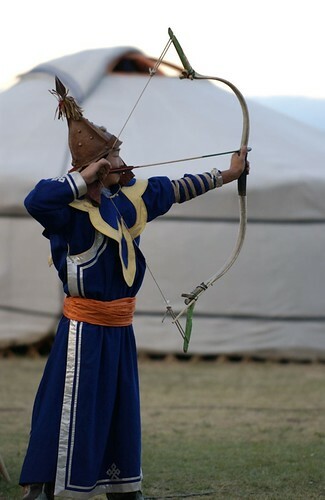 This entry was posted in wordless wednesday and tagged archery, asia, mongolia, sports, wordless wednesday on October 21, 2009 by isabella mori. a common trap that we fall into in our thinking is when we jump without reflection between what is and what should (ought) be. in philosophy, that has been referred to as the “is/ought” problem. just because i say that yes, teachers used to beat students, and yes, i used to smoke (the “is”) does not mean that teachers ought to beat students and people ought to smoke. interestingly enough, around the time that we had this conversation, i also wrote about solution focused brief therapy. the solution focused tradition has much in common with appreciative inquiry, which has something to offer here. we work from what is there: it engages the whole system. data from the past is analysed for common themes (including data from the client’s conversations with selected colleagues).’ this establishes ‘what is’. the client then articulates ‘what will be’ and ideas are put into practice. it is quite permissible to experiment with not talking about the problem at all as it is ‘irrelevant to the solution’ and the coach also has ‘no idea where the solution will come from’. as gregory bateson pointed out, the solution comes from a second, or higher, order of thinking. in the past, i walked 4 miles an hour. this is the reality, this is what happened. there is no regret, and it is not labelled a problem; it’s just “what is”. by next year, i will [or want to] walk 5 miles an hour. note that there is no “ought” (“i should”). it is a future-directed expression of faith (“i will”) or desire (“i want to”). i can do this by hiring a trainer, buying those expensive runners, rewarding myself with a trip to the south pacific, going to the gym each day, reading biographies of famous walking athletes, getting a really fast dog, befriending a training buddy, or signing up with a walking group. there is no discussion of how hard it is to walk 5 miles an hour, or how you’ve trained before but it didn’t work, or how you can’t get motivated because walking reminds you of your athletic girlfriend (which would be discussing the problem). the brainstorming that created the ideas comes from a different part of the brain than the problem. i have seen this magic work over and over again. for example, i routinely ask clients who are very shy about networking to make one super simple phone call. “call them and ask them for their fax number; that’s all!” once they manage to do that, sweaty hands and all, they often surprise me by telling me that they found the person on the other end of the phone so nice that they ended up chatting for 5 minutes. what would be your baby food? This entry was posted in emotional health, therapy and tagged acceptance, appreciative inquiry, gregory bateson, solution focused coaching on October 19, 2009 by isabella mori.